I read that post on Caroline Myss’ Facebook page this weekend and it got me thinking: Is this how Chiropractic First has helped so many people with migraines? Chiropractic First has helped a tremendous number of people with migraines. Some have gone from almost daily migraines to having them only a few times a year. Others have gotten off their migraine medication completely. And still other patients simply no longer have debilitating pain levels. And we have had breathtaking success helping people to decrease their anger and increase their patience. Patients have reported chiropractic care has resulted in them not being so controlling, in being more forgiving and being more at peace. Many parents have reported their children get frustrated less easily. Most often they report their kids can practice piano or cello for longer without frustration. Others report their teachers say school work is less stressful. We don’t make children better students or musicians or people more enlightened—we simply help their bodies better manage the frustration and stress of life. 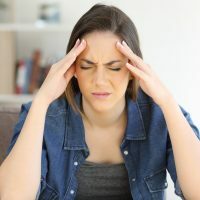 But is there a connection between helping with migraines and helping manage frustration and control? It is an interesting question. For those of you not familiar with her work, Caroline Myss is an amazing writer, speaker, teacher and medical intuitive. I have learned a great deal about energy medicine and the phenomena of healing from her. But I’m wondering about your experiences. If you have migraines do you notice a connection? If you know someone who has them, does that pattern seem likely? Check out the comments and please add you thoughts. And if your know someone who has migraines, or is struggling with issues of control and frustration and hyper-vigilance, let them know we have helped lots of people in the past. They can call the office at 847-869-1313. There certainly does seem to be a correlation between unresolved anger and migraines. I suffered from migraines for years, and tried all sorts of medications and therapies. But five years ago, after a string of very painful episodes, I sought out chiropractic and have not had a single episode since. Noticeably, my temper has also improved dramatically, and I cannot help but think the two are related.